We treat all of our denture patients like Cosmetic Smile Makeover patients because we are restoring a patient’s smile. 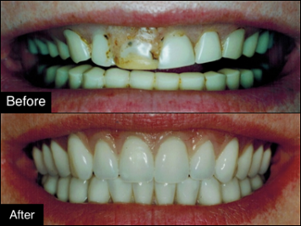 Because of this, we make a fantastic set of cosmetic dentures for our patients. We start by taking a series of photographs of our patients face from many different angles. Then we take accurate impressions of the patient’s teeth and their current bite. After careful study and planning we turn our information over to our laboratory artist, Troy Phinney, who is an absolute genius at making a custom set of teeth that fit great and look real. For more photos visit our denture smile gallery.